The Xiaomi Redmi 4 comes in a plain white box with just the charger (a regular 5V/2A unit with no fast charging) and a USB cable. 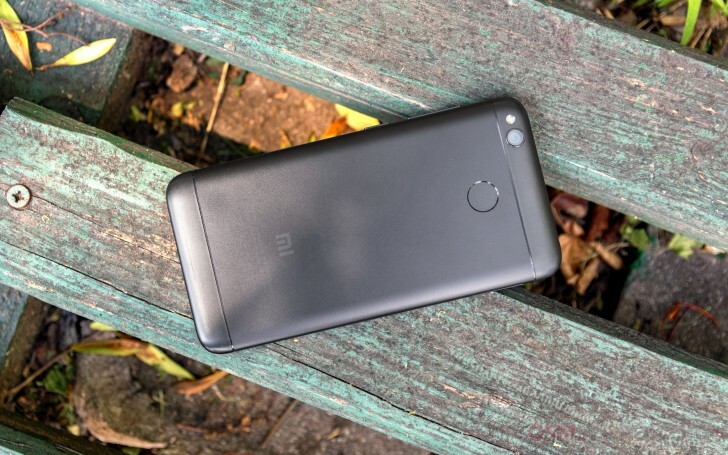 Even high-end Xiaomis don't have a headset bundled, so we can't complain about it missing in the budget Redmi 4's package. The Redmi 4 is quite similar to previous iterations in terms of physical dimensions - at 139.2 x 70 x 8.7mm there's a fraction of a millimeter in each direction to set it apart from the 3x (or any other of the numerous Redmi Threes). The 8.7mm of depth and an overall small footprint make it seem a little chubby at first, but we know that's in no small part due to the 4,100mAh battery inside, so we're good. The same goes for the 150g of weight, which would have otherwise been a little too much for a 5-incher. Unlike the all-plastic Redmi 4a we had a month ago, the Redmi 4 sports an aluminum back - a touch of premium on an affordable device. There are a couple of plastic antenna strips top and bottom, and we somehow managed to scratch the bottom one, despite our typically careful handling of review devices. The camera is in the top strip, joined by the flash. The camera module sticks out just a tiny bit, and the ring around the lens is slightly raised above the glass, so it should be safe. The fingerprint sensor is here on the back as well, as that's how most Redmis roll, while some flagship Mi phones have it on the front. The Redmi 4, on its front, has the customary set of capacitive navigation keys below the 5-inch display. It's a 'reverse' arrangement of Recent Apps/Home/Back. Under the Home key there's a notification LED - not the usual top-bezel location, but it works just as fine. Up top there's the earpiece with the 5MP front camera to its right and the ambient light/proximity sensors on the other side. The microUSB 2.0 port is on the bottom - the Redmis don't get USB-C just yet. Don't be fooled by the two grilles, there's just one loudspeaker and it's behind the right one. The primary mic is around here too. There's more good stuff on the top - the 3.5mm jack goes without saying, but you'll also find an IR emitter, and we've always appreciated Xiaomi's remote control app. The secondary mic is here too. The right side of the phone features the power button and the volume rocker - all click positively. The card slot is on the left and it takes a microSIM and nanoSIM or microSD card. A hybrid slot is better than nothing, but still not ideal. The 28nm chipset inside the Redmi 4 may not be particularly efficient, but there's plenty of battery to make up for that - 4,100mAh is a lot for a 5-inch phone. While the Redmi 4 performance in our tests wasn't mind-blowing, it still posted some respectable numbers. We're happy to report that it lasted for around 12 hours in each of our tests carried out with the display on - browsing the web over Wi-Fi and watching videos. A little short of 20 hours on a 3G call isn't too shabby either. Feeding those numbers along with standby draw in our super-complex (not really) formula we get an overall endurance rating of 80 hours. 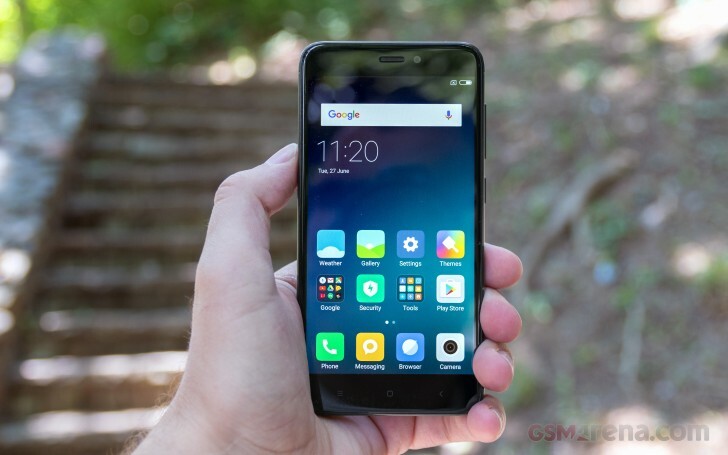 Our endurance rating denotes how long a single battery charge will last you if you use the Xiaomi Redmi 4 for an hour each of telephony, web browsing, and video playback daily. We've established this usage pattern so our battery results are comparable across devices in the most common day-to-day tasks. The battery testing procedure is described in detail in case you're interested in the nitty-gritties. You can also check out our complete battery test table, where you can see how all of the smartphones we've tested will compare under your own typical use. The Redmi 4 relies on the proven Redmi formula of a 5-inch 720p IPS display. There is the Redmi 4 Prime that boasts a FullHD panel, but the 4 is just fine with its 294ppi density. In our tests, the Redmi 4 posted quite high numbers for brightness, particularly for its class. Less impressive is the contrast that can't reach 1000:1 due to the high illumination of blacks. Sunlight legibility is good, even better when you consider we're dealing with a budget-minded LCD panel. Color accuracy isn't spectacular, with a clearly visible green cast spoiling your whites (DeltaE for white is 8.6). Average DeltaE is 4.6 though, which is a reasonable number. There are three display modes (Warm/Standard/Cool) and a separate saturation setting, which is either Brilliant (default) or Standard. Playing with those can get you bluer whites (rather than green) in Cool mode, while Warm is the most accurate with an average DeltaE of 3.4.